The Delhi High Court refused to stay the trial court order to frame charges against the former Himachal Pradesh chief minister. 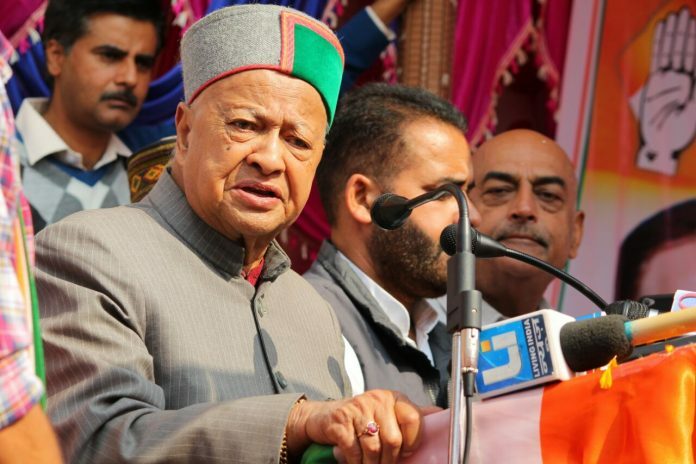 New Delhi: The Delhi High Court Wednesday refused to stay the trial court order to frame charges against former Himachal Pradesh chief minister Virbhadra Singh for allegedly amassing disproportionate assets (DA) worth over Rs 10 crore. Justice Sunil Gaur also sought CBI’s response on pleas of Singh and his wife Pratibha challenging the trial court order to frame charges against him. “Let the charges be framed in the trial court. I am not going to pass any interim order,” the judge said and posted the matter for April 16. The 82-year-old Congress leader and his wife have sought quashing of the December 10, 2018 trial court order directing framing of charges against them and seven others in the case lodged by CBI. The high court was informed by senior advocate Abhishek Manu Singhvi, representing Singh, that the matter is listed before the trial court on February 22 for formal framing of charges. During the hearing, CBI special public prosecutor Anil Grover told the court that the agency has already filed an appeal before the Supreme Court challenging a limited part of the high court’s March 31, 2017 order in which it had said that the consent issue will be adjudicated by the trial court and notice was earlier issued to Singh. Delhi under the central government. It has said the special judge has wrongly held that sanction for prosecution under Section 197 of the CrPC was not required to be taken as the charges are framed under the IPC and Singh was serving as the chief minister of Himachal Pradesh at the time of taking cognisance of the charge sheet. The trial court, in its December, 2018 order, had said that Singh intended to cause loss to tax authorities by presenting unaccounted money as sale proceeds of apples and had also ordered framing of charges against his wife and seven others for allegedly abetting in the offences. The trial court had said that Virbhadra Singh and Anand Chauhan “fraudulently and dishonestly” signed a memorandum of understanding (MoU) by ante-dating it to give an impression that it was signed on June 15, 2008 by them. A charge sheet running into over 500 pages, filed in the trial court, claimed that Singh had amassed assets worth around Rs 10 crore which were disproportionate by 192 per cent of his total income during his tenure as a Union Minister.